The Naskapi Band of Quebec was created in 1984 by the CNQA. It replaced the Naskapis de Schefferville Indian Band, which had been created under the Indian Act by Order-in-Council in 1971. In April, 1996, Council authorized changing the name of the Band to Naskapi Nation of Kawawachikamach (the “Nation”). That change came into effect on 1 May, 1999. The Nation acts through its Chief and Council, who are elected for a term of three years. to promote and preserve Naskapi culture, values and traditions. The Naskapi Village of Kawawachikamach (the “Village”) was created by Québec legislation pursuant to Section 8 of the NEQA. It acts as the municipal government for the Category IB-N land. The Village is also responsible for providing police services on Category IA-N land. The Chief and Councillors of the Nation act as Mayor and Councillors respectively of the Village. The Naskapi Landholding Corporation (“NLC”) was created by Québec legislation pursuant to Section 5 of the NEQA. It exercises very important powers under the NEQA in addition to being the owner of the Category IB-N land. The NLC does not, however, have any source of funds. Consequently, it was relatively inactive since the early 1980s, and the majority of its duties have been carried out by Council. Given the urgency of approving amendments to Section 10 of the NEQA and completing the transfer of ownership of Category IB-N land, it became important to reactivate the NLC. A meeting of the members of the NLC was held on 19 November, 1998. The Chief and Councillors of the Nation were elected as the Board of Directors of the NLC. representation on certain of the interests of the Naskapis at the Hunting, Fishing and Trapping Coordinating Committee. The activities of the NLC are funded principally by the Nation. Fire protection is the responsibility of Council. The Kawawachikamach Volunteer Fire Department (the “Department”) has approximately twenty members under the direction of a Fire Chief. It practices approximately once every two weeks. Its equipment consists of a fire truck, and standard fire-fighting equipment. The fire-fighters receive a token honorarium that reflects their level of activity in a given year. Council’s responsibilities include ensuring that the Department has the equipment that it needs, arranging for training, and generally ensuring that the Department is able to respond to emergencies in a timely and effective manner. Construction of the Jonathan Shecanapish Memorial Fire Station began in 1999 and was operational by Summer, 2000. Funding by Canada and Québec for the direct costs for policing services on Category IA-N land by special constables appointed under the Quebec Police Act is guaranteed under Section 13 of the NEQA, although no specific amount for policing services is provided for in Section 13. For the past eight years, funding for the costs of policing services on Category IA-N land has been furnished to the Village under the Tripartite Policing Agreements, signed between the Village, Canada, and Québec. The funding assumes a police force consisting of three full-time Native police officers. The Village is free to allocate the budget as it pleases, as long as it is spent on police-related matters. Because the Village has no administrative personnel, the budgets provided under the Tripartite Policing Agreement are administered by the Nation. Nevertheless, the police officers are employees of the Village and not employees of the Nation. On 15 February, 1999, the Sachidun Childcare Centre opened its doors. 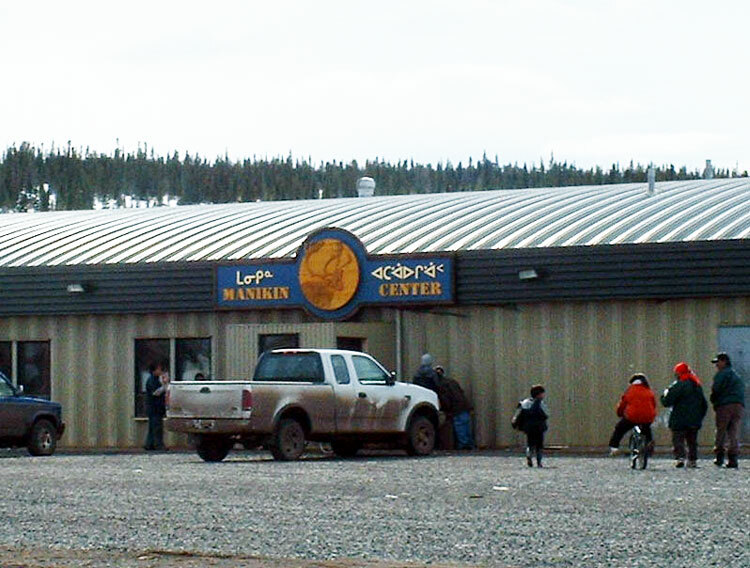 The Centre employs eight Naskapis. It can accommodate up to 26 children: five between 6 and 18 months; three between 18 months and 2½ years; 10 between 2½ and 4 years; and eight between 4 and 5 years. Garage Naskapi Inc. is incorporated under the Companies Act of Québec. Its principal business activity is the operation of the filling station in Kawawachikamach. Its fixed assets include a building, tanks, pumps, and equipment worth 46 241$. 8 a.m. to 11 a.m. and 4 p.m. to 7 p.m., Friday to Sunday. 8 a.m. to noon and 2 p.m. to 6 p.m., Thursday - Saturday; closed on Sundays. They are fixed by Council and can be changed easily. Kawawachikamach Energy Services Inc. ("KESI") was incorporated as a for-profit corporation under federal legislation effective 27 May,1998. Its Board of Directors consists of the Chief and Council of the NNK. manage the billing for electricity usage in Schefferville. In January, 1998, a numbered company was incorporated as a for-profit corporation under federal legislation to organize commercial caribou harvests. Such harvests will use a mobile processing facility that will operate under Agriculture and Agri-Food Canada’s standards. To date, large numbers of caribou have not come sufficiently close to the Kawawachikamach/ Schefferville area, during the times when they can be hunted for commercial purposes, for the harvest to be economically viable. Imuun has developed an Enterprise, Resource, Planning, and Management software application. Said application comprises the following modules: Inventory; Rental; Assets Management; Advanced; Tracking. Please visit www.imuun.com for additional information. As part of Industry Canada’s Broadband for Rural and Northern Development Pilot Program, the Naskapi Nation of Kawawachikamach and Naskapi Imuun Inc. officially launched on 26 January, 2005, a wireless, bi-directional satellite high-speed Internet service in Kawawachikamach, Schefferville, Matimekush, Lac John, and Squaw Lake. The Nation’s project is the first one in Quebec to launch broadband Internet services as a result of the Industry Canada program. The high-speed Internet access permits inhabitants of remote regions to participate in education and training programs that would otherwise be unavailable to them. It also fosters an environment more conducive to socio-economic development by bringing northerners’ computer literacy and proficiency more in line with those of southern communities. C/I has signal priority over R. Platinum Plus only for customers who subscribed to the Platinum Package before 25 January, 2005. The principal features of the organization of the Naskapi education system are outlined in Section 11 of the NEQA. A Naskapi Education Committee (“NEC”) consisting of Naskapi members exercises the functions described elsewhere herein. Pursuant to Section 11 of the NEQA, the Central Québec School Board has been appointed by the Government of Québec to oversee the general administration of the Jimmy Sandy Memorial School (“JSMS”), in collaboration with the NEC. The Naskapi education programme includes the youth, adult and post-secondary sectors. Mr Sandy Robinson, Naskapi Education Coordinator and School Principal, is in charge of managing the day to day business activities of the school as well as acting as the Secretary of the NEC, implementing its plans and policies, and acting as its liaison officer. The school is allocated 17.24 teachers based on present student enrolment figures. 60% are Naskapi teachers and 40% are non-Naskapi. The school is well supported by a support staff, which includes a school psychologist, psycho-educator, Naskapi curriculum development coordinator, liaison officer and guidance counsellor. The Naskapi curriculum development coordinator is assisted by three part-time technicians. A small number of employees are engaged to perform various services at the school through government-sponsored training programs. Staff who hold full-time positions have union representation, which means that they have collective agreements in place which predetermine their salary and working conditions. Post Secondary (outside of the community) - All English (French speaking Naskapis can attend French learning institutions). Following the signature of the NEQA, the Naskapi Development Corporation (“NDC”) was incorporated in June, 1979 when the Québec National Assembly adopted Bill 27. The name of the NDC in French is Société de développement des Naskapis, and its name in Naskapi is Naskapi Gamowtapechsunaiyow. The NDC is managed by a Board of Directors comprising eight Naskapi beneficiaries. Four directors are elected for two year terms at the Annual Assemble of the members. encourage and assist in the preservation of the Naskapi language, values, culture, and traditions. Naskapi Northern Wind Radio Station. One of NDC’s mandates is to facilitate language and cultural projects. Over the years NDC has evolved a strategy to accomplish its goals in the culture and language sector. This strategy includes fostering co-operation with other Naskapi organizations on projects concerning culture and language, providing vision, leadership and professionalism in accomplishing these projects, and developing a local team of Naskapi resource persons to increasingly support efforts toward reaching Naskapi language and culture goals. Without the ongoing support of the NDC, it is doubtful whether any of the following vital cultural projects would be accomplished at all. The NDC fulfills one of its roles in the community as facilitator for cultural and language projects. It maintains a staff of Naskapi persons trained as language specialists, assisted and guided by Mr Bill Jancewicz, the NDC’s linguist. Other professionals from outside the community are also called upon when needed to facilitate the language and cultural projects. The NDC’s translation department is involved in producing a collection of Naskapi legends and stories that were recorded in the 1960s. All of the forty-four stories that the NDC has on tape have been transcribed in syllabics and keyboarded. They were then roughly translated into English and then painstakingly edited these files in order to make them easier to read. Currently, the translation staff is working through the very technical steps of assuring accuracy and consistency. Work of this nature is very complex and rather time-consuming. The steps include carefully numbering the corresponding sentences in a parallel Naskapi and English translation, proof-reading the Naskapi, having the Naskapi version checked and revised, preparing interlinear analysis for the stories, preparing a revision of the English, preparing a French translation and finally, preparing the text for publication. The linguistic analysis of the legends and stories is also vital. It has already helped to improve the accuracy of the Naskapi Grammar and the revisions of the Lexicon. What is being learned about Naskapi discourse is applied to the translation strategies. It is therefore not only interesting for story telling but also because it encapsulates multiple facets of the Naskapi culture as encoded in the texts. In order to preserve these important archives, all the recordings have been digitized and transferred to optical media (CDs). These digital recordings are also being edited revised and reproduced in broadcast quality so that they may be played on Naskapi Radio and enjoyed by the entire community. The Naskapi community has eagerly awaited their own translation of the Bible in contemporary Naskapi. Since early contact with the Hudson Bay Company and the clergy that accompanied them, the Naskapi have embraced the Christian faith. But the only Scriptures available to them for over a century were translated into dialects of Cree from near James Bay. The Naskapi language is different enough from these dialects that a translation project has been underway in the Naskapi community since the mid 1970s. Naskapi leadership invited linguists affiliated with Wycliffe Bible Translators to assist them in producing their own translation of the Bible. Since 1988 work has progressed on this project and in the 1990s the Corporation adopted it as one of their own mandates in close cooperation with the Naskapi church leadership. The Corporation’s linguist has facilitated this project through the years and the community finalized the publication of the New Testament in Naskapi in 2007. Besides the New Testament, work has also progressed on portions of the Old Testament, including Genesis, parts of Exodus, Judges and the Psalms of David. The Corporation remains committed to bringing God’s Word to the Naskapi people through this ongoing project. Naskapi Hymnbook - NDC’s language department played an important role in assisting the Naskapi parish priest’s efforts in producing the first ever Naskapi song book. NDC’s full time translators have all they can do to keep up with the routine translation tasks related to its administrative operations. They are fully committed to producing all of the official documents of the NDC in the Naskapi language, as they join with others in the community to keep the Naskapi language strong. An important cultural project is the interviewing of Naskapi Elders who remember life prior to the relocation to Schefferville. The work continues and further consultation is conducted each year. The NDC’s translation staff continues to work on translating and transcribing the taped interviews from previous years for incorporation into the History project. A number of brochures have been completed, and more are nearing completion: one on caribou; and one on hunting. The translation department, in co-operation with the NDC’s linguist and Dr Marguerite MacKenzie, continues its work on researching and compiling the Naskapi Grammar. In 1998, Ms Julie Brittain, as part of her Ph.D. thesis, analyzed a major portion of the sections on Syntax. The NDC’s linguist produces and presents academic papers on Naskapi language analysis and development each year, and these are incorporated into the Grammar. More major points in the grammar are expected to be completed in the coming months but the publication of the entire book will probably not occur for some time. Some sections, however, are being published as they become available. The Naskapi Lexicon was published by the NDC in 1994. While it is a useful and well-organized language resource for the Naskapi community and others, over the years the inevitable errors and omissions are being discovered. Since this will continue to happen, steps have been taken by NDC’s linguist to assure that the corrections are made and accounted for. The Naskapi Lexicon computer file is being revised by carefully keyboarding the collected list of changes and additions to the Lexicon. At the same time, an analysis of the word-parts of the words in the lexicon is being accomplished. This will assist in advancing the knowledge of how the Naskapi grammar relates to the Lexicon. The result of the revisions will likely be a printed addition to the Lexicon that may be distributed as a part of the existing three-volume set. The Corporation’s linguist, in collaboration with the National Library of Canada in Ottawa, has prepared the Naskapi Lexicon for release on the Internet. Full access to the words in the Lexicon is available as an interactive on-line resource on the web, and can be browsed in English, French or Naskapi. see http://www.collectionscanada.ca/naskapi/ to try it yourself. While this project has been on hold for the past few years, steps have been taken in recent years to complete the work on this important project. In essence, this is a project designed to assign traditional Naskapi names to land forms and bodies of water in Naskapi territory, with a view to having these names included on official maps. Beyond this, however, this work also bears on the Naskapi History, Traditional Knowledge and Language projects, since during the interviews with the Elders many of these important topics are discussed. In light of the ageing and eventual passing on of our Elders, it is expected that work will continue on this project as long as it is practical to do so. This project was begun in earnest during 1997 and 1998 stemming from the strong interest and encouragement of one of our Elders and NDC Board Members, Mr Joseph Guanish. In his part time work at the Jimmy Sandy Memorial School’s Naskapi Curriculum Development department, Mr Guanish has been routinely producing texts and diagrams describing aspects of life, travel and survival in the bush. While some of these skills might be regarded as a quaint or old-fashioned look at the “old days”, they are actually seen as representing vital aspects of Naskapi culture that must be passed on to coming generations of Naskapis. Recognizing the importance of these documents and the knowledge that they represent, NDC’s linguist has integrated the translation and production of these documents as part of the overall work of the NDC’s linguistics and translation department. During recent years, a number of these documents have been transcribed and translated, and work has begun in digitizing and labelling the illustrations with a view to making this information available to the community and beyond. NDC cooperated with various organizations within the community to form the Naskapi Language Development Committee. This group, which meets several times throughout the year, includes the Chief, the language staff at NDC, the Naskapi Curriculum Development staff at the Jimmy Sandy Memorial School, the Translation staff at the Naskapi Nation Office, the Naskapi parish priest, and other members of the community interested in promoting the Naskapi language and culture. These meetings are designed to foster cooperation between the various organizations at work to preserve and develop the Naskapi language, and to address lexical, grammatical and orthographic questions as they arise. Besides reporting on their various activities, the Committee has handled various spelling issues and assisted each other in the best use of resources used for Naskapi language promotion. According to Section 10 of the Northeastern Quebec Agreement, the Naskapis were to receive health and social services primarily from the Schefferville Hospital Centre. When Kawawachikamach was built, therefore, it was provided only with a small dispensary and a house for the nurses. Shortly after the Iron Ore Company of Canada announced its decision to close the mines in Scheffferville in 1982, the Government of Quebec demolished the Schefferville Hospital Centre. The Nation reached an agreement with the Government of Quebec whereby a new and larger dispensary would be built at Kawawachikamach and would act as a point of service under the authority of the CLSC l'Hématite at Fermont. In the early 1990s, the Nation decided that it had acquired the experience and maturity necessary to assume greater responsibility for planning and delivering health and social services to its members. The Government of Quebec agreed to enter into a review of Section 10 of the Northeastern Quebec Agreement with a view to enhancing the autonomy of the Nation in matters of health and social services. After several years of negotiation, An Act to amend the Act respecting health services and social services concerning the Naskapi Nation of Kawawachikamach was assented to by the National Assembly on 16 June, 2000. The Act contemplated the transformation of the Naskapi Dispensary into a Local Community Service Centre, to be administered by a Board of Directors composed in majority of Naskapis. The Council of the Nation retains a right of oversight of the activities of the Naskapi CLSC. The Naskapi CLSC was incorporated on 15 February, 2001, and became operational shortly thereafter.